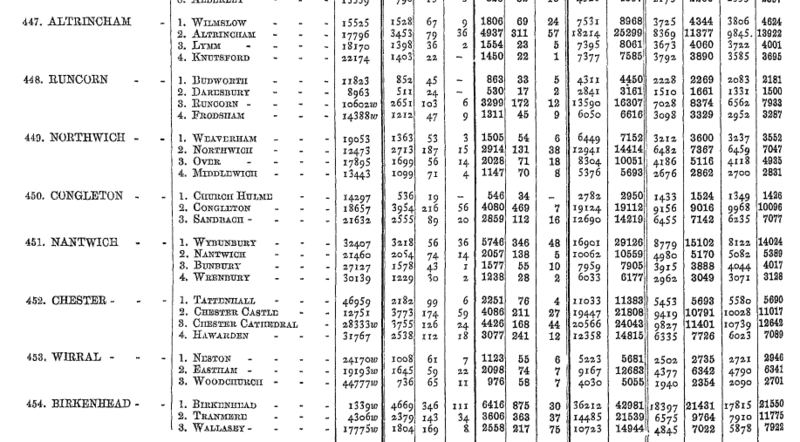 This post relates to the Birth and Death Indexes in England & Wales. Often when searching the GRO Indexes or searching for people with particularly common surnames you might find yourself with a few, possibilities as to which is the correct certificate. Most people will guess and hope for the best, if it’s not one then they’ll buy another until they have the correct one. But there are actually a few tricks you can apply to figure out the correct one. Firstly you’ll need to know how the GRO indexes were organised, once you know this you can apply a few techniques to figure out the record that is most likely to be the correct one. The GRO indexes were compiled quarterly that is all the records that were registered in that quarter. This is why you will often see on popular sites “JAN-FEB-MAR” or “Q1”. Each County was divided in to Registration Districts which were in turn subdivided in to Sub-Districts which again were divided in to Civil Parishes. Over the years these Sub-districts and districts did change every now and then. The entries for each Sub-district are ordered by Date of Registration rather than by Date of Birth or Death. Each Sub-district will usually start on the right-hand page which is odd numbered. Up to Q4 1911 there were up to 10 entries on each page of the indexes, but after Q4 1911 there were 6 entries per page. The first step is to extract all of the births for that quarter. You can do this easily by going to FreeBMD and searching for just the registration district and the quarter. 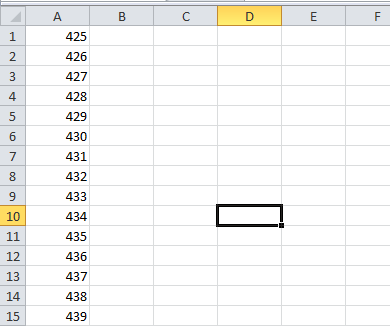 Then copy and paste the results in to a spreadsheet. You should then have a quick look through to get rid of any obvious errors such as duplicates or discrepancies. You can use the Page Map-District Index to get the page range of the particular district any outside of this range can be deleted, sort by page number and you should end up with something similar to the following screenshot. “Sheet1” this is the name of the original sheet in your spreadsheet. 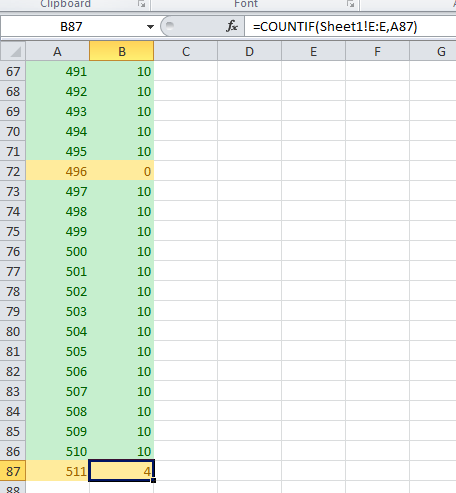 E:E,A1 Means that it will count the values in column E that match the value in “A1” of the second sheet. i.e if you wanted to count from column B in a sheet named “birkenhead” by a value in B1 of the second sheet you would use: =COUNTIF(birkenhead!B:B,B1). Looking for breaks or difference in the data will hopefully show you where the districts split and what page numbers relate to which Civil Parishes. Pages for this year should have up to 10 entries per page. However the data is almost never perfect. The most accurately written/transcribed districts will have data that will have all 10’s a few 9’s and some 0’s as page breaks. The Birkenhead district is not a particularly friendly one. It has loads of 10’s and 11’s which shouldn’t really be possible. You can go through these and check for duplicates missed, for example in page 440 I have “11” entries when really there should be 10. You can see below that there is a “Nelli Hardcastle” and a “Nellie HARDCASTLE”. This is obviously the same person so we can remove this. 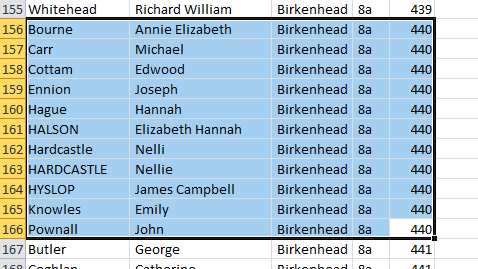 It’s also worth going through any with more than 10 entries individually using the GRO’s new search function and searching each name individually to make sure the page number is correct I found around 25 discrepancies this way in Birkenhead’s data. Once you’ve sorted out all of the anomalous numbers you can figure out which parishes relate to which page numbers. You can download my spreadsheet here if it is needed as an example. In the Birkenhead spreadsheet of the eighty seven page numbers there are eighty two “10’s”, two “9’s”, two “4’s” and a “0”. We know that in this year each page would have had a max of 10 entries per page so as we know there are 3 parishes within the Birkenhead district we can deduce which ones are which. As a new page would be started after each parish we know that a 4 must mean that the page was only half filled in, indicating the end of a parish. From this we can deduce that the following page numbers relate to the following parishes. Now if you were searching and you knew that your John Smith’s family all lived in Tranmere then you know which one to buy first! Often when searching the GRO Indexes or searching for people with particularly common surnames you might find yourself with a few, possibilities as to which is the correct certificate. Don’t forget that the GRO’s indexes are compiled from copies of the original registers which are still held at the local register offices. Hence the GRO’s data is inherently flawed due to errors and omissions made in the manual copying process. Many of the local Register Offices are placing their indexes online in a similar manner to FreeBMD.org.uk so that they can be searched. Links to all known BMD Index website can be found on the UKBMD.org.uk website. The menu on UKBMD has links to “Local BMD” and “GRO BMD” pages. For example, the Lancashire BMD website has over 20 millions entries to date, and is regularly added to. Thanks for that a great addition!